Online travel agent www.ZUJI.com which operates Travelocity New Zealand www.travelocity.co.nz is to strengthen their commitment to the New Zealand and the South Pacific Online Market by expanding their operation and increasing their Auckland based staff. New Zealand Market Manager Kathryn Wilson has been on the ground in Auckland for the past 2.5 years, flying the flag and managing both New Zealand and the South Pacific Markets. Kathryn will now hand over the management of New Zealand to Market Manager Jacinda Carter, leaving her to focus on the South Pacific. Jacinda brings extensive experience to this role having worked in hotels for the past 13 years. She joins the Travelocity APAC team from Sky City Auckland where she led the reservations and revenue team. Jacinda will be responsible for continued development of hotel supplier relationships and strengthening the New Zealand Online Market. Also joining the team is Leeza Chan as a Market Coordinator supporting both Market Managers in the New Zealand and South Pacific Region. Leeza has worked in hotels for the past 3 years specialising in reservations and yield. Prior to joining the Travelocity APAC team she was at Chifley Suites in Auckland. ZUJI General Manager for Australia and New Zealand, James Gaskell and Alex Niewenhuys, Regional Manager for hotel business, both agree that with a renewed focus on New Zealand and the South Pacific we hope to build on our success and provide greater distribution opportunities to our suppliers and better value for our customers". In 2005, 2006, 2007, 2008 and again in 2009, ZUJI® was recognised as Asia Pacific's 'Best Online Travel Agent', as awarded by TTG travel magazines in Asia Pacific. ZUJI was also awarded as the 'Best Online Travel Agency' in 2007 by the TravelWeekly (Asia) Industry Awards. 'Condé Nast Traveler' magazine (March 08, US-edition) announced ZUJI as the 'best travel web site for flights in Asia'. ZUJI gives travellers in Asia Pacific online access to real-time travel bookings for thousands of hotels and hundreds of airlines, as well as bringing cruises, car hire, attraction bookings, package tours and other inspirational travel offers, products and tools online. ZUJI operates travel websites in: Singapore, Hong Kong, Australia, Korea ('Nextour'), New Zealand ('Travelocity'), and India ('Travelocity India' and 'Travelguru'), as well as many 'Travel Partner Network' sites throughout Asia Pacific. ZUJI's 'Travel Partner Network' division allows third-party travel suppliers, agents and web sites to harness the travel booking functionality of ZUJI for flight, hotel, packages, activities and other travel content and products. ZUJI's B2B partners include: Virgin Blue (Blue Holidays: Australia & New Zealand). ZUJI is owned by Travelocity®, an international leader in online travel. Travelocity is owned by Sabre Holdings Corporation, a world leader in travel commerce. ZUJI has an online member base exceeding 1 million travellers. ZUJI's Chief Executive Officer is Mr Roshan Mendis. An extensive four-year renovation program worth almost $2 million has seen the Best Western Wyndhamere in Shepparton, Victoria completely transformed. The overhaul of the motel included the addition a new wing, eight new rooms built and two existing rooms renovated, a new look for the on-site restaurant followed by the motel facade, giving the property a contemporary feel. The queen deluxe rooms were also completely renovated with plastering of the walls and ceiling, new furniture, carpets, new bathrooms, drapes and appliances. Angela Mangiameli, manager of the Best Western Wyndhamere said, "Our guests have been thrilled with the new look; we've received lots of positive comments on check-out. They're really happy with the quality and standard of the rooms, especially the new flat-screen TVs". Shepparton, only two hours north of Melbourne is renowned for its friendly people, beautiful natural scenery, wineries, art galleries and sporting precincts for basketball, soccer, football as well as a BMX track that opened earlier this year. For more information or to book, call 131 779 or visit http://wyndhamere.bestwestern.com.au. "Chiva-Som has acquired a reputation in helping people all over the world to achieve lasting wellness in mind, body and spirit. In doing so, we have leveraged a quality in the Thai people, that of Thai hospitality. Thai hospitality promotes the genuine care for the wellbeing of our guests and this has distinguished Chiva-Som in the world of wellness and sets us apart in terms of service delivery. It is the staff of Chiva-Som who truly deserves the credit for this important recognition," said Krip Rojanastien, CEO & Chairman of Chiva-Som and son of the founder Boonchu Rojanastien. SpaFinder Readers' Choice Crystal Awards has recognised Chiva-Som since 2005; the Crystal Awards Asia Pacific has recognised Chiva-Som since 2004; CondeNast Traveller UK has recognised Chiva-Som since 1998 and Luxury Travel & Style Magazine has recognised Chiva-Som since 2007. Chiva-Som is Asia's ﬁrst comprehensive wellness retreat and destination spa, providing proven transformations in mind, body and spirit towards optimal wellness. For more information about Chiva-Som, please contact Travel the World by calling 1300 950 622 or by visiting www.traveltheworld.com.au. A secluded world of beauty and serenity, Chiva-Som is the "Haven of Life" – a luxury health resort dedicated to revitalising the mind, body and spirit. The beachfront resort represents tranquility at its best with luxurious accommodation, nestled within lush tropical gardens. Focusing on greater well-being and vitality, Chiva-Som offers extensive fitness, spa and holistic health facilities to help you relax, restore, rejuvenate and redirect. Personalised programmes and treatments are designed for everyone, blending Eastern philosophies with Western diagnostic skills. Widely regarded as the Best Destination Spa in the World, Chiva-Som welcomes you with unique Thai hospitality. Located in the Royal city of Hua Hin, the resort is less than three hours by car south of Bangkok. Chiva-Som is the proud recipient of numerous accolades, most recently 'Best Destination Spa' The Crystal Awards 2010; 'Top Ten Best Medical Programs' SpaFinder Readers' Choice Crystal Award 2010; '4th Favourite Destination Spa' Conde Nast Traveller Readers' Spa Awards 2010; 'Best Amenities/Products' and 'Top 5 Destination Spa' Conde Nast Traveller 2010 Readers' Travel Awards; 'Best Overseas Spa Resort' Luxury Travel & Style Magazine 2010 Gold List(and every year since 2007), 'Best for Mind, Body and Sprit' and 'Best for Medical' SpaFinder's Readers' Choice 2009; '2nd Favourite Destination Spa' Conde Nast Traveller 2009 Readers' Travel Awards; 'Top 5 Overseas Retreat' Cond้ Nast Traveller Readers' Spa Awards 2009 (and every year since 1999); 'Spa Cuisine of the Year' AsiaSpa 2008; 'Favorite Spa in Thailand' and 'Top 10 Medi-Spas' Spa Finder 2008; 'Best Spa in the world' The ULTRAs-The Ultimate Luxury Travel Related Awards 2008. Chiva-Som has achieved the prestigious Green Globe certification recognising our commitment to operating at the world's highest environmental standard on all levels of operation. The resort has several initiatives, policies and practices in place for energy efficiency and conservation, waste water treatment and reuse, fresh water conservation, waste minimisation and recycling, air quality management and environmentally friendly product-usage. South African Airways (SAA) is pleased to announce it is again the official airline sponsor of the ATP tennis tournament starting in January at Sydney's Olympic Park. According to Thevan Krishna, SAA's Head of Australasia, the airline's exclusive global deal with ATP, governing body of the men's professional circuit, is now in its fifth year and runs until 2012. The airline became a platinum sponsor this year. "The Medibank International will take place at Sydney Olympic Park from January 9, 2011 with the women's finals to be played on January 14 and the men's finals on January 15," Thevan said. "This year both the men's and women's tennis promise to be very exciting. Major players like Juan Martin del Potro and defending champion Marcos Baghdatis in the men's and Kim Clijsters and our own Samantha Stosur in the women's are all scheduled to play," he said. "During the week we will be welcoming many of our clients in the travel industry to some of the matches, our way of showing our appreciation of their support for SAA through the past year. "SAA is thrilled to again be the official airline sponsor and the exclusive airline for the event. The ATP sponsorship is a great initiative for us here in Australia. This year's tournament is expected to attract capacity crowds to see some of the world's best tennis players. "Our involvement with ATP since 2006 when we first signed the deal has been great and each year we benefit from the high quality management of the event and the fact that our clients look forward to and enjoy being with us out at Olympic Park. "The ATP sponsorship is terrific for our branding in Australia and we look forward to the opportunities for SAA that will result. SAA has had a big year with the World Cup being so successfully staged in South Africa and our involvement with sport continues with being part of the tennis in 2011," Thevan concluded. 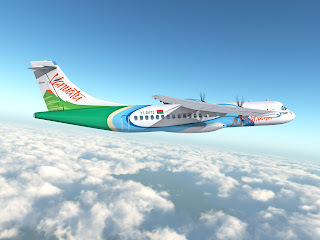 20 October, 2010 - Vanuatu's national airline, Air Vanuatu, has embarked on a major expansion programme , centred on its newest aircraft, a 68-seat ATR 72-500 turboprop airliner. Since replacing a 45-seat ATR 42-300 late last year, the larger, more efficient aircraft has been used to boost capacity on existing domestic services, as well as increasing by 33% the airline's seat availability to Noumea in the neighbouring nation of New Caledonia. Now, Air Vanuatu is working with regulatory authorities to introduce ATR 72-500 flights to more destinations, the most promising being service between Vanuatu and Fiji. More domestic island destinations are also being considered. 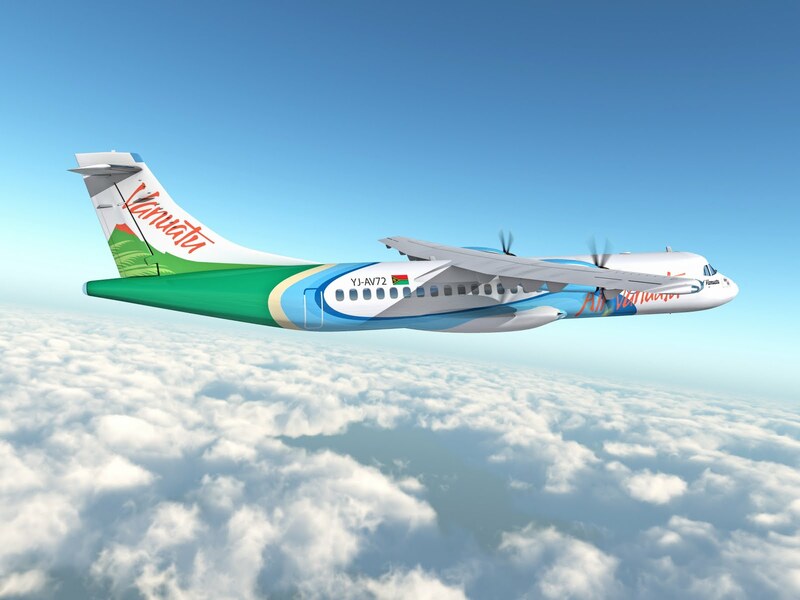 "The ATR 72-500 has been a welcome addition to our fleet, increasing passenger numbers and comfort," said Air Vanuatu's Chief Executive, Joseph Laloyer. "The aircraft has allowed us to increase capacity to Noumea, and we are looking at other regional ports, which previously we were restricted from doing," he said. "The aircraft has proven very popular with our passengers and we are pleased with its steady growth." 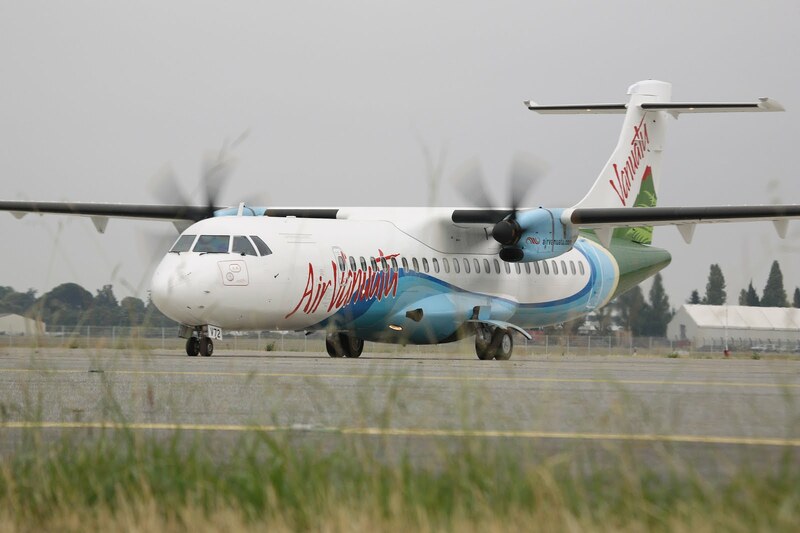 Air Vanuatu's total domestic passenger traffic has increased by 10 per cent since late last year when the brightly-coloured ATR 72-500 arrived in the South Pacific from the ATR production line in Toulouse, Southern France. In the same period, the carrier has achieved an impressive 33 per cent saving on costs including fuel and aircrew, while also reducing significantly its carbon dioxide emissions, thanks to the increased efficiency and lower environmental impact of the ATR 72-500. Using the ATR 72-500, Air Vanuatu has also been able to offer more seats for passengers connecting to and from its longer international sectors between the national capital Port Vila and destinations including Australia and New Zealand. And for domestic passengers, there have been even more seats available, due not only to the increased size of the ATR 72-500 over its predecessor, but also the ability of the larger aircraft to continue to access regional airports. . Although airstrips at some destinations are shorter or narrower than at larger destinations, a key benefit to Air Vanuatu of the ATR 72-500 is its ability to land on strips as short as 1100 metres or just 14 metres wide. Air Vanuatu also has greater operating flexibility and increased safety margins due to the ability of the larger ATR 72-500 to carry additional fuel, enabling the airline to accommodate diversions to more alternate airfields as required. ATR Director of Sales for Australasia and Pacific Islands, Guillaume Huertas, said turboprop airliners were continuing to gain popularity, not just with airlines but with passengers. "Today's turboprop aircraft consume much less fuel and produce less carbon emissions than comparable-size regional jets, or older turboprop equipment," said Mr Huertas. "They also offer cabin comfort equal to or better than most jets, delivering the highest standards not just on medium to long haul routes but also on shorter journeys, regardless of whether these are between key cities in major markets or the smaller regional communities of the Pacific." ATR is the world's leading manufacturer of 50-74 seat regional turboprop airliners, having sold more than 1000 ATR 42 and ATR 72 aircraft, which are used by over 160 operators in 90 countries. At 1 October this year, ATR had a backlog of more than 150 aircraft on order. These include 98 of the next generation ATR series – 600 family – 93 ATR 72-600s and five ATR 42-600s. ATR is certified to ISO 14001, the worldwide standard for environmental management and sustainability. Swissôtel The Stamford was crowned Asia's Leading City Hotel and Singapore's Leading Business Hotel at the prestigious World Travel Awards held last week in Delhi, India. With these wins, Singapore's towering icon of world-class hospitality has more cause for celebration as it attains several international awards in a year that commemorates the 30th anniversary of Swissôtel Hotels & Resorts. The hotel recently garnered two other prestigious international awards of excellence - Asia Pacific's "Best Business Hotel" in the BT-MICE Awards Category of the 21st TTG Travel Awards 2010, its second consecutive win, as well as the Luxury Hotel & Conference Centre (Global Winner) award and Overall Winner in the World Luxury Hotel Awards 2010. "These two new awards are resounding tributes to Swissôtel Hotels & Resorts' 30th Anniversary celebration as one of the world's leading hotel groups. The accolades are a testament of Swissôtel The Stamford's unwavering pursuit of excellence in every facet of the signature service that we extend to both business and leisure travellers, and an affirmation of our credo 'A Passion for Perfection'. We are proud and privileged to have received these recognitions," said Mr Aiden McAuley, General Manager of Swissôtel The Stamford and Regional Vice-President, Asia-Pacific, Swissôtel Hotels & Resorts. "The critical mass of awards that we have received over the two weeks are the apex of what has so far been a truly memorable year. Our sincere appreciation and gratitude to our valued guests, corporate partners and colleagues, and those who voted for us, and have made this remarkable achievement possible," he added. Renowned for hosting significant international business events, Swissôtel The Stamford hosted the following in the past year alone: the Interpol General Assembly; the APEC Leaders Meeting and APEC CEO Summit; Global Entrepolis @ Singapore; the Aviation Leadership Summit for Singapore Airshow and Events; CommunicAsia 2010 - Ministers' Conference, and the first Soccerex Asian Forum. (www.swissotel.com/singapore-stamford) Conveniently located in the heart of Singapore, Swissôtel The Stamford is a deluxe hotel that boasts a prime Singapore location amid the diversions of the Raffles City shopping complex, just 20 minutes away from Singapore Changi International Airport. Southeast Asia's tallest hotel, Swissôtel The Stamford offers a luxurious range of 1,261 guest rooms and suites with a wealth of amenities, as well as panoramic views of Singapore, Malaysia and parts of Indonesia. It also boasts an impressive array of 16 restaurants and bars, including the Equinox Complex, Singapore's most exciting dining and entertainment complex. The hotel also houses the 70,000sqft Raffles City Convention Centre; comprising 27 meeting venues with technologically advanced business facilities and services. National and international tourist icon Ayers Rock Resort at Yulara will be purchased by the Indigenous Land Corporation (ILC) for $300 million. The ILC has exchanged contracts to acquire the entire Resort, including all hotels and accommodation, associated infrastructure, the airport and workers village, in an arrangement with Wana Ungkunytja (WU), which represents Indigenous business interests in the nearby communities of Mutijulu, Imanpa and Docker River. ILC Chairperson Shirley McPherson said the purchase of the Resort from the GPT Group was a positive opportunity for Australian tourism and Indigenous economic development. "The ILC Board is delighted that WU, which operates the Anangu Tours business, will acquire an interest in the Resort and will be an integral partner in its running and development," Ms McPherson said. 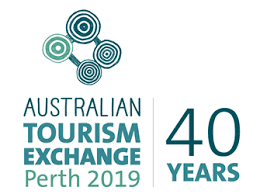 "The Resort represents a unique and probably the biggest opportunity to advance the training and employment of Indigenous people in the Australian tourism and hospitality industries. "There is a great opportunity to increase the current limited Indigenous employment at the resort which has a workforce of 670 people. "By 2015, 200 Indigenous people will be employed at the Resort and this will climb to 340, more than 50% of total employees, by the end of 2018," she said. The ILC will establish a National Indigenous Tourism Training Academy at Yulara, with 200 people in training each year from 2013. Over the next five years 500 Indigenous trainees are expected to graduate from the Training Academy, with graduates gaining employment at the Resort and in other jobs in the tourism and hospitality industries across Australia. One of the first priorities will be to re-establish training facilities and accommodation and, in this regard, there will be a close working relationship with the Sydney-based National Centre of Indigenous Excellence (NCIE), with the object of establishing a campus of the NCIE at the Resort. The acquisition will lead to the return of 104,000ha of culturally significant freehold land to Traditional Owners, and the arrangement with WU will see Anangu playing a continuing role in resort operation and management. "Traditional Owners already play a key role in the management of the Uluru-Kata Tjuta National Park and this has helped to protect and enhance the very things that visitors come to see," Ms McPherson said. "The acquisition of the Resort is a turning point for Indigenous economic development in Central Australia where tourism and hospitality are key areas for Indigenous employment growth. It will also be a catalyst for a surge in Indigenous tourism across Australia". "The provision of a memorable cultural and environmental tourism experience at Uluru and Kata-Tjuta will continue to be the primary focus, but the Resort will increasingly provide badly-needed Indigenous jobs and industry-accredited training", she said. Wana Ungkunytja Chairperson Mrs Margaret Smith said the ILC acquisition of the Resort would not only provide training opportunities and employment for Indigenous people – it would also pave the way for a more complete cultural experience for International and Australian visitors. "Anangu have been watching the Resort for 30 years. When the Resort was built we thought that there would be lots of training and jobs for us," Mrs Smith said. "We want our young ones to have good jobs on their own country. We want visitors to meet Anangu and learn about Tjukupa – traditional Anangu law and culture. "We think that the ILC will be a good partner to work with because we want the same things – to share our culture with visitors in the proper way, and proper training that leads to good jobs. "The Resort purchase is also important to Nyangatjatjara College, an Indigenous secondary college based at Yulara. Students will be able to do real training and get real jobs. "The National Indigenous Tourism Training Academy will give our young ones the chance to get real training and jobs and we look forward to strong partnerships between the Resort and other Indigenous groups in Central Australia," she said. All external borrowings to support the acquisition are forecast to be paid off after seven years of operation and all internal funding by the end of year 10. As part of the acquisition, the ILC will take over GPT's Voyages platform which administers the Resort's tourist booking and management functions. The ILC wishes to acknowledge GPT's co-operation during its extensive due diligence process. Vatulele Island Resort, Fiji, has just been announced as Fiji's Leading Resort in the 2010 Travel Awards. Coined as the ultimate in barefoot luxury, Vatulele Island resort is located on one of the most stunning islands in the world. Priding itself on offering the utmost in luxurious and opulent service, Vatulele will cater to the guests every whim. Described as the 'Oscars' of the travel and tourism industry by The Wall Street Journal, World Travel Awards represent the ultimate accolade for a company. This year, a phenomenal 185,000 industry professionals participated in the voting process which is both monitored and independently audited. Vatulele is not only the home away from home for many celebrities, but is a private haven for those looking for a true barefoot retreat. 17 stunning bures pan the beach front and are met at each end with Vale Viqi (the Grand Honeymoon Bure), and The Point. If extravagance is what you are after these bures definitely deliver, even treating you to private butler service. Vatulele was last awarded this prestigious accolade in 2007. At Vatulele Island Resort the attention to detail and focus on the guest experience is paramount but never taking away from the true beauty of Vatulele, this is the ultimate island paradise. Glenworth Valley Outdoor Adventures has been named as a finalist in the Adventure Tourism category of the prestigious 2010 NSW Tourism Awards. The NSW Tourism Awards recognise and celebrate the diverse range of tourism products throughout NSW, the outstanding individuals who promote and support the industry and showcase the State's finest tourism operators. Barton Lawler, General Manager, Glenworth Valley Outdoor Adventures says "Glenworth Valley has long been renowned as Australia's premier horse riding centre however this recognition in the Adventure Tourism category of the NSW Tourism Award acknowledges the unique adventure experiences available at Glenworth Valley such as our quad biking, abseiling and kayaking tours. Being named as a finalist in the awards against other respected tourism operators is testimony to the quality of our adventure tourism experiences and customer service." The winners of the 2010 NSW Tourism Awards will be announced at the Grand Pavilion, Rosehill Gardens on Friday 19 November 2010, with winners at the state level automatically being entered into the Qantas Australian Tourism Awards. Glenworth Valley Outdoor Adventures is Australia's largest horse riding and outdoor adventure centre and is located on 3000 acres at Peats Ridge in the hinterland region of the NSW Central Coast, just 15 minutes drive from Gosford. Renowned as Australia's premier horse riding centre, Glenworth Valley now offers a range of exciting adventure activities including quad biking, abseiling, kayaking adventures and camping, with all activities suitable for all ages and abilities. The Great Barrier Reef's most beautiful rainforest island resort, Dunk Island, has been named Australasia's Leading Family Resort at the World Travel Awards ceremony held in Delhi, India, on 14th October 2010. Founded in 1993 and described by The Wall Street Journal as the Oscars of the travel and tourism industry, the World Travel Awards are recognised globally by the hospitality industry as the foremost acknowledgement of excellence in product and service. This year, 185,000 industry professionals participated in the voting process which is both monitored and independently audited. The popular Tropical North Queensland property won the accolade from a field of finalists consisting of the prestigious St Regis Bora Bora Resort in French Polynesia, Sonaisali Island Resort Fiji, and fellow Queenslanders Hayman Island Resort and Paradise Resort Gold Coast. Hideaway Resorts, operators of Dunk Island Resort and Bedarra Island Resort, are about to reveal details of a multi-million dollar upgrade and enhancement program. Rupert Greenhough, chairman of Hideaway Resorts, said that the program would unlock the full potential of Dunk Island Resort and that the World Travel Award indicated the property was well positioned to capitalise on the momentum as it demonstrated the resort was highly regarded by international and domestic sales agents. "We are honoured to win this award and delighted that an iconic Tropical North Queensland property won against such strong interstate and indeed international competition. It demonstrates how popular our tropical island resorts continue to be in that the award is voted by national and international sales agents who are, in the end, customer driven. The award also recognises the collective effort of the Dunk Island Resort team - it is a richly deserved accolade for the islands staff and management," he said. Dunk Island Resort is currently undertaking a raft of initiatives in readiness for the upgrade program, including providing WiFi connectivity throughout the resort's common areas and pool environs as well as being the first in Australia to introduce 3G iPads for guests to use anywhere on the resort. The resort has just taken delivery of 4 new catamarans and a water trampoline, and is set to add other major activity assets as part of the planned upgrade in the coming months. For more high resolution downloadable images of Dunk Island Resort visit www.dunk-island.com media image gallery. Boeing will discuss its revolutionary 787 Dreamliner with members from the global travel and tourism industry at World Travel Market's Opening Ceremony in London on Monday 8 November. Ushering in a new era of air travel, Jeff Cacy, Boeing's Managing Director, Airline Marketing Services, will speak about what has been described as the most environmentally friendly airplane ever produced. The 787 is the fastest-selling commercial airplane in history. Japan's All Nippon Airways is the first recipient of the aircraft next year. Fiona Jeffery, Chairman of World Travel Market, described the Dreamliner as a "glimpse into the future, a big step forward." "The Dreamliner, with its ability to offer a vastly more comfortable flight and its superior economic performance, is set to change air travel forever," said Jeffery. "World Travel Market, the premier global event for the travel industry, has become known as a reliable industry indicator of major international trends and developments and the birth of the Dreamliner and the way it will change travel, is of huge significance to the whole industry." Jeff Cacy at Boeing has supreme confidence in the way the Dreamliner will transform the travel industry. "Business travelers are willing to travel, but not in uncomfortable surroundings," he said. "Airlines are buying the Dreamliner because of its efficiencies, but they are also buying it because the customer experience is profoundly different and uniquely comfortable." The 787 Dreamliner offers passengers a better flying experience and provides airline operators greater efficiency to better serve the point-to-point routes and additional frequencies passengers prefer. The technologically-advanced 787 will use 20 percent less fuel than today's airplanes of comparable size, provide airlines with up to 45 percent more cargo revenue capacity and present passengers with innovations that include a new interior environment with cleaner air, larger windows, more stowage space, improved lighting and other passenger-preferred conveniences. "Extra-large windows, coloured LED lighting, air purification, greater humidity and increased cabin pressure have been designed to make the Dreamliner the most comfortable aircraft on the market," said Cacy. A "vertical gust suppression" system has also been installed to soften the up and down motions caused by turbulence. World Travel Market's Opening Ceremony is at 11.30 am on Monday 8 November, Platinum Suite 4, ExCeL London. The event will also be broadcast on giant screens in the Central Boulevard. The Melbourne Convention + Visitors Bureau (MCVB) has recorded strong results for the 2009/10 Financial Year, securing Business Events expected to inject more than $269 million into Victoria's economy over the next five years. Announcing the results at MCVB's Annual General Meeting, MCVB's CEO, Ms Sandra Chipchase, said initiatives such as a new digital marketing strategy and further developing partnerships with Government and industry stakeholders were key to the Bureau's success. "The 2009/10 Financial Year was one of the most challenging in the Bureau's history. "The global economic crisis continued to hit the Association market, and we saw a distinct trend in the corporate market postponing meetings until the new financial year. "Despite the challenges, I am pleased to report that MCVB, with the support of Government, strategic partners and our members, continued our track record of success, securing Business Events which will bring 71,891 delegates to Melbourne over the next five years." Ms Chipchase said that MCVB's key successes for 2009/10 included an increase in incentive sales and national business wins, as well as winning major international multi-disciplinary Business Events. 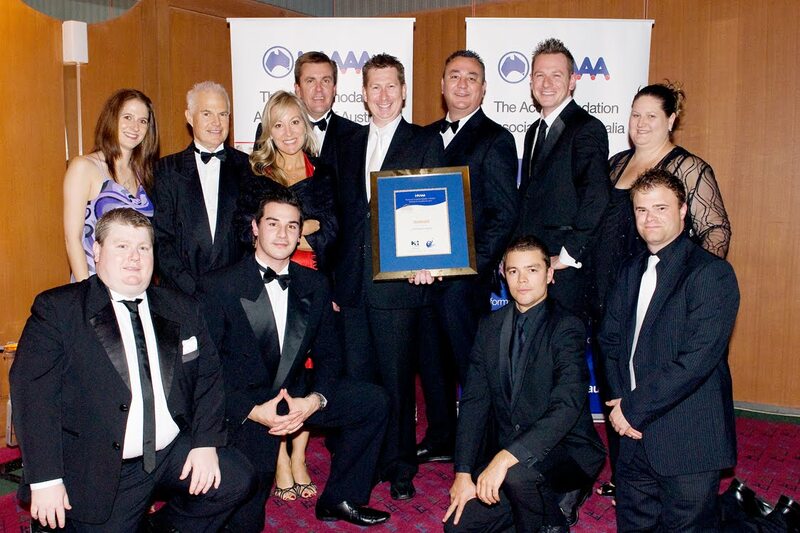 "MCVB secured an impressive 47 national and international Association conventions for Melbourne in 2009/10. 63rd Annual DPI/NGO Conference 2010 (marking only the third time this event has been held outside of the UN's New York headquarters), confirming the diversity of Melbourne's appeal to a wide range of international interest groups and Associations. "Wins also included major international Association conventions, such as the 35th Congress of the Societe Internationale d'Urologie 2015, expected to attract 4,000 delegates and generate an economic impact of $10.8 million for the State. "Our Incentive Unit also continued its impressive track record, this year achieving a strike rate of securing 87% of all business it bid for. "New initiatives, such as joint sales missions and advertising initiatives to target new and emerging markets, such as India, China and Korea, assisted in generating these results. "MCVB's annual Asia Roadshow also contributed to this success, with MCVB and partnering members engaging with 190 travel agents and buyers in Malaysia and Beijing in 2009, generating strong sales leads." Ms Chipchase said that expansions to the MCVB team also contributed to the Bureau's success throughout the year. "This year we created a new Convention Servicing & Government Partnerships Team to oversee MCVB's growing portfolio of Government-related international meetings, delegate boosting activities and convention support services. "We also expanded our Business Development team to further our sales research capacity and to extend our capacity to target national Associations and sector-specific luminaries to bid with us to secure major events for Melbourne and Australia. "This contributed to a 41% increase in the number of leads generated by MCVB's Business Development team, with a potential economic impact of $468 million." Ms Chipchase said that 2009/10 was also a year of innovation, with new marketing and research projects assisting the Bureau's performance. "This year MCVB created a new digital marketing strategy, which included creating a world-first online digital delegate boosting tool. "Not only will this tool assist us with achieving and potentially exceeding expected delegate numbers, but also in increasing the number of those accompanying delegates to Victoria." Ms Chipchase said that other new marketing initiatives included a television campaign on the Australia TV Network, reaching six million viewers in 44 countries across Asia, the Pacific and India. She said that continuing to provide members with business leads and international exposure was also a priority. "MCVB's Melbourne Meetings + Events Service (MM+ES) provided strong results for members this year, with referrals up 21%, and business booked up 29%, generating $22 million worth of short-term business for Victoria." Ms Chipchase said that the Bureau is also expanding its initiatives to promote regional Victoria, this year embarking on a marketing program with partners including Tourism Victoria to promote regional Victoria's Business Events capabilities. Ms Chipchase acknowledged the support of Government and MCVB members in helping to drive the Bureau's success in 2009/10, and said she and her team looked forward to expanding Melbourne's reputation as a leading Business Events destination in 2010/11. SEATTLE - Chiapas, the southern-most state in Mexico, has won the bid to serve as Destination Host to the Adventure Travel Trade Association's eighth annual Adventure Travel World Summit, an assembly of 600 adventure tourism professionals, which will be held October 17-20, 2011 in San Cristóbal de las Casas. Announced by the ATTA and Mexican tourism officials October 7 during the closing ceremonies of the 2010 Adventure Travel World Summit (ATWS) in Aviemore, Scotland, attended by an estimated 600 delegates representing more than 50 countries, the ATTA reported its decision came after extensive review of several sites throughout North America. In addition to meeting all prerequisites outlined in the bidding process, Chiapas won the 2011 ATWS bid primarily for its partnership orientation and readiness and willingness to press forward on progressive adventure tourism development, as well as for the tremendous potential benefits to the local tourism economy and the ATTA's members worldwide. "The Summit ties in directly with Mexico's overall tourism strategy because we want to complement the world's understanding of Mexico as a sun and beach destination to show a side of Mexico that is even more exotic and diverse naturally and culturally" said Antonio del Rosal, Marketing Coordinator for Mexico´s Tourism Board. "For years, we've witnessed the bottom-line positive effects of the ATTA's impact on destinations which have previously hosted Summits such as Brazil, Quebec and Norway, and we believe such global attention on Chiapas next year will help usher in a new era of responsible tourism for Mexico." Entering its seventh year, the ATTA's Summit conferences engage, enlighten, inspire, and energize the leaders of the adventure travel community with networking, business and professional development programs, educational seminars and emerging adventure destination product review opportunities. "For six years, the ATTA has partnered with public and private organizations throughout Mexico with hopes of seeing tourism evolve to include the full depth and breadth of the country's cultural and natural assets," said ATTA President Shannon Stowell. "Intensive support from the federal, state and community level throughout Mexico over several years has resulted in a powerful and positive decision making process, with input from local adventure tour operators, representatives of San Cristóbal, the state governor and from the tourism ministry of Mexico." With its ATWS events, the ATTA and its Summit delegates, primarily tour operators, destination marketing organizations, tourism boards, media, agents, adventure lodges, and service organizations (e.g., transportation, technology, marketing, etc. ), influence the manner in which adventure travel is introduced, executed and sustained in any given destination worldwide. These adventure travel organizations collaborate to encourage the industry to adopt sustainability and best practices that give back to the people and places impacted by adventure travel. Early Bird Registration, which ends April 15, 2011, is open at www.adventuretravelworldsummit.com. Established in 1990, the Seattle-based ATTA (www.adventuretravel.biz) is a global membership organization dedicated to unifying, networking, professionalizing, promoting and responsibly growing the adventure travel market. ATTA members include tour operators, destination marketing organizations, tourism boards, specialty travel agents, guides, accommodations, media and service providers. Host of the annual Adventure Travel World Summit executive trade conferences (www.adventuretravelworldsummit.com), the ATTA also makes possible www.Adventure.Travel, the traveler's hub of physical, cultural and nature-based adventure travel and guide to trusted tour operators from around the globe. Established in Fiji as an environmental beautification company, Green Steps has been busy cleaning beaches in the Suva area. Seeing the need to improve the cleanliness of the beaches and foreshore around Suva, Alexander Austin founded the company in 2008. So far Green Steps has installed 100 rubbish bins in the Suva area and there are plans for more to be installed. With these expansion plans in place, there are also plans to increase the number of employees. The company has also been active in educating the public especially school students on the importance of cleanliness and the use of rubbish bins in public places. The highlight of the tour will be the Anzac Day Dawn Service on the battlefield at Villers-Bretonneux, an experience shared by many Australians whose ancestors fought and died in the area. 'I love learning about history on the spot, and am looking forward to talking with descendants at places like Ypres and Fromelles,' Dr Stanley said. 'I'm excited to be sharing stories of Australians on the Western Front - it's a great privilege to be able to do this in their company.' 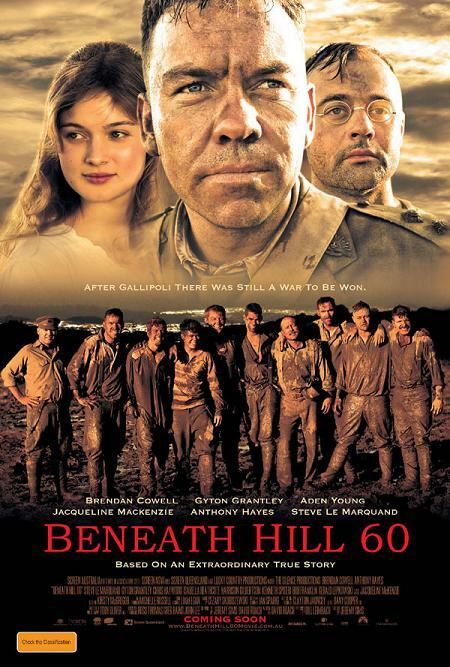 The tour will also visit Hill 60, site of the massive mine explosion in June 1917 that featured in the recent feature film Beneath Hill 60. The hill still bears the scars from the conflict, including a massive crater formed by the explosion of the mine. Dr Stanley will be travelling as a historian with Mat McLachlan Battlefield Tours, Australia's battlefield specialists. The first-class 9-night Anzac Day on the Western Front tour begins in Paris on April 18, 2011 and visits all the key Australian battlefields in France and Belgium. Tours of Paris, Versailles, Champagne and Bruges are also included, as are tips, many meals, 3- and 4-star accommodation and more. The tour costs $3797 per person, twin share, land only. Mat McLachlan Battlefield Tours also offers a range of discounted airfares for passengers joining its group tours. Phone 1300 880 340 or visit www.battlefields.com.au for more information. Close on 1000 Australians visited Fiji every day throughout July helping to chalk up another new monthly record for the destination. A total of 29,436 Australians (an average of 949 per day) visited across the month, a 19 per cent increase on the 24,729 figure achieved for the same period in 2009 according to figures released this week by the Fiji department of information. The strong July performance takes Fiji's total Australian for the seven month period January to July to 156,720 in itself a 38 per cent increase over the 113,149 total achieved in 2009. The Australian result has again helped push Fiji's international visitor arrival figures for the year into new ground with a 339,056 total recorded for the January-July period. This represents a growth of over 19.5 per cent the same period last year. Australian business now represents 53 per cent of total traffic. The positive Australian result was reflected across all of Fiji's key markets. This included a return to positive growth for Canadian visitor arrivals – up five per cent to 1782 - for the first time this year. New Zealand visitor arrivals climbed by six per cent to 13,949 while US figures rose by five per cent to reach 6560. The national tourist office's ongoing efforts in several key emerging markets continued to pay off – albeit off small base numbers - with visitor arrivals from China achieving a massive 149 per cent increase. Taiwan business grew by 45 per cent while visitor arrivals from India climbed by 15 per cent. Traffic from the UK/Europe remained steady and while increases for the month only rose by 0.7 per cent, the destination is bracing itself for a very strong result in August, the traditional holiday and travel month for much of the northern hemisphere. 10th October 2010, Mojave, CA. Virgin Galactic, the US company developing the world's first commercial manned space flight system and tourism business, is delighted to announce the successful completion today of the first piloted free flight of SpaceShipTwo, named the VSS Enterprise. The spaceship was released from its mothership at an altitude of 45,000 ft (13,700 metres). During its first flight (visit www.virgingalactic.com to view images) the spaceship was piloted by Pete Siebold, assisted by Mike Alsbury as co-pilot. The two main goals of the flight were to carry out a clean release of the spaceship from its mothership and for the pilots to free fly and glide back and land at Mojave Air and Space Port in California. Other detailed objectives of the flight were successfully completed, including; verification that all systems worked prior and following the clean release of Enterprise; initial evaluation of handling and stall characteristics; qualitative evaluation of stability and control of SS2 against predictions from design and simulation work; verification of performance by evaluating the lift-to-drag ratio of the spaceship during glide flight; practice a landing approach at altitude and finally descend and land. Virgin Galactic is now well on the way to becoming the world's first commercial space line with 370 customer deposits totalling $50 million. Future commercial operations will be at Spaceport America in New Mexico where final preparations are taking place for a finished runway inauguration ceremony on Friday 22nd October 2010. National Geographic channel in the United States will be showing a documentary on the build up and preparation for the first flight of VSS Enterprise on Monday, 18th October at 10.00pm ET/PT. Queen Elizabeth – the latest addition to the Cunard Line – has arrived in Southampton ahead of her official launch on Monday. The vessel will become the third in the fleet – joining the Queen Mary II and Queen Victoria. Queen Elizabeth was built in Italy and replaces the Queen Elizabeth 2 (QE2) which made its last transatlantic crossing in 2008. "Queen Elizabeth is a spectacular addition to a spectacular fleet, and we would love as many people as possible to take the opportunity to come out and share with us the excitement of welcoming Southampton's newest star," said Peter Shanks, Cunard's president and managing director. This is the third Cunard ship to take the name Queen Elizabeth. The first was launched on the Clyde in Scotland in 1938 by the then Queen Elizabeth - who later became the Queen Mother - with the present Queen, aged 12, also present. The Queen launched the second Queen Elizabeth, the QE2, on the Clyde in 1967. She also named the QM2 at Southampton in 2004. The new Queen Elizabeth is one foot longer and one foot wider than the QE2 - which was sold to Dubai-based property developers Nakheel after being retired. However, with 16 decks it is much taller. The QE2 remains moored at Port Rashid awaiting an uncertain future. Queen Elizabeth will be named on Monday 11th October by Her Majesty the Queen. She will depart on her maiden voyage at 17:00 hours on Tuesday 12th October. An elderly British couple were ordered off luxury Cunard liner QM2 after an explosive row with fellow passengers during a black-tie dinner. 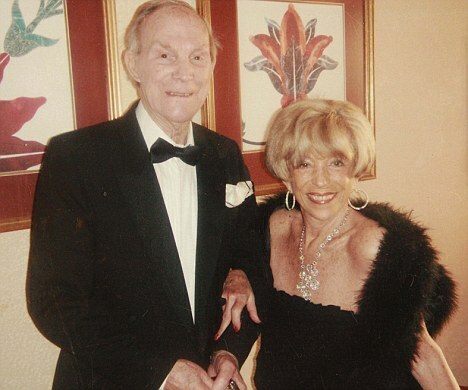 Frederick Evans, 91, and his Broadway producer wife Gloria Sher, 82, were told by the captain to leave at the next port following what was said to be an expletive-ridden argument over anti-Semitic remarks. The couple faced being dumped in a remote part of Quebec in Canada before fellow passengers came to their defence and asked that they be allowed to stay. Award-winning Malaysian chefs have been flown in from Kuala Lumpur for the event, to showcase many of Malaysia’s tantalising food with Indian, Thai, Arab & Chinese influences. The chefs will recreate timeless dishes from the Malaysia’s beloved first Prime Minister’s famous cookbook, Tunku’s Kitchen. This writer was invited to indulge in the dinner menu on offer and only got to sample half of the huge range of dishes on offer despite two visits to the buffet! Certainly a worthwhile investment for lovers of good food to take advantage of while the opportunity exists, don’t miss it! Australians love their food, particularly when fresh produce, cooking and authentic flavours are involved. Tourism Malaysia has embarked on an extensive food promotion with a range of events not only for food loving Australians here but in Malaysia as well. For Australians wanting to sample Malaysian delights without leaving home, Tourism Malaysia in conjunction with Malaysia Airlines and The Grace Hotel in Sydney’s CBD are holding a Flavours of Malaysia Food Festival at the Grace Brasserie from October 7 – 29. In Malaysia, the Fabulous Food Malaysia festival kicks off in October, with three full months of culinary celebrations and events planned right up until Christmas. Celebrating its tenth year, the Malaysian International Gourmet Festival is Malaysia’s premier fine dining event. The month long festival with special events and offerings by the best world-class chefs throughout Malaysia will take place from 1- 31 October 2010. In November, the ASEAN Food Heritage Trail will showcase Malaysia’s multi-cultural heritage through traditional Asian and fusion dishes, throughout Malaysia. During the month long food trail, visitors will be able to enjoy authentic regional flavours, and witness cooking classes and demonstrations by renowned ASEAN chefs, maestros at preparing their signature ASEAN dishes. The food trail is a great way for visitors to become acquainted with and gain an appreciation for Malaysia’s rich cultural heritage from all ten of Malaysia’s Southeast Asian neighbours—Thailand, Indonesia, Brunei, Cambodia, Singapore, Philippines, Vietnam, Laos, Myanmar and Malaysia. Then from December 1 to 31 the Malaysian Street Food Festival will run with street stalls and celebrations all over Malaysia sampling the best of Malaysia hawker food. As part of the celebration the Ministry of Tourism has conducted a poll to discover the most popular Malaysian dishes, revealingthat Satay, Roti Canai and Chicken Rice are the top three Malaysian Favorites for 2010. Constellation Hotels is toasting their success after winning the award for Hotel Chain of the Year at the Hotel Motel & Accommodation Association's 2010 National Accommodation Industry Awards for Excellence which took place at RACV Royal Pines on the Gold Coast on Friday 24th September. The glittering function was attended by over 200 leaders and representatives from the tourism and accommodation industries in addition to the newly appointed Shadow Minister for Tourism, Regional Development and Federal Member for Paterson, the Hon. Bob Baldwin MP. McLeod's Daughters and Home and Away actress, Sophie Cleary, performed the role of MC at the event with the assistance of former Sydney Swans player Jared Crouch. "The HMAA National Accommodation Industry Awards for Excellence are all about achieving and maintaining the highest standards in the accommodation industry", said Lorraine Duffy, HMAA's Chief Executive. "HMAA understands and rewards the vital contribution of accommodation operators in creating, inspiring and promoting tourism, through providing the highest standards of service to their guests". Constellation Hotels Managing Director, Jonathan Wooller said, "Winning the highly coveted Hotel Chain of the Year provides wonderful recognition for all of the properties that are part of Constellation Hotels extensive network across Australia and New Zealand. In the past year we have worked hard to grow our hotel network, to build our brands in the regions in which they operate, and to develop our people as the future leaders in the hospitality industry, so we are thrilled to take home this award". Constellation Hotels was selected as a winner from among four other finalists in the Hotel Chain of the Year category, where properties are judged in equal parts by a written submission and a mystery assessment. HMAA's Awards for Excellence are one of the only annual accommodation awards to incorporate a true mystery guest component in their judging process. Constellation Hotels was also well represented across a wide range of individual award categories with the following hotel finalists recognised; Australis Diamond Beach Resort and Spa ((4 ½ Star Luxury Self Contained Accommodation), Chifley Eastern Creek and Chifley Doveton (4 ½ Star Luxury Hotel Accommodation), and Chifley Penrith (3 ½ Star Superior Hotel Accommodation). In addition to the chain and property categories, Constellation Hotels Founder, Darryl Courtney O'Connor received an HMAA ACES award, which recognizes the outstanding contribution of long serving members within the accommodation industry.Ends. PHOTO: Constellation Hotels Team – (Bottom row – left to right) Matthew Ryan, Nick Walker, Bill Bradley, Vince Wilson, (Top row – left to right) Nikki Walton, Darryl Courtney O'Conner, Ann Whitelock, Peter Sweeny, Cameron Stewart, James Gardiner, Kristen Carville, Jodie Cairns. Revealed - Toga's CEO working incognito for UNDERCOVER BOSS! 7th October 2010: Last week, in front of over 200 Toga Team Members, Rachel Argaman – CEO of Toga Hospitality – announced she has been working undercover at Vibe Hotels, Medina Apartment Hotels and Travelodge Hotels. Her experience will feature in the brand new, Australian version of the hit series Undercover Boss. Argaman wanted to learn and experience first hand what the company can do to improve each and every guest experience and to ensure that Toga Hospitality is, and remains, a compelling place to work as well as to stay. She left the comfort of the office and her home to take part in a unique undercover mission to examine the inner workings of the company. A familiar face around each of Toga Hospitality's 51 hotels, she was heavily disguised and donned various uniforms as she learnt how to clean rooms, check in guests, prepare guest meals, set up for conferences and so much more! By going undercover, Argaman had the unique opportunity to get to know even more members of the incredible Toga Team and to hear some home truths about the business. Her experience has resulted in significant and unique changes to help Toga Hospitality continue to serve its guests, look after its Team Members and continue to grow well into the future. Argaman said: "Companies don't succeed; people do – at Toga Hospitality, we follow this as our mantra. The reason I wanted to be involved in Undercover Boss was to look at our business through the eyes of our Front Line Team. This was a true learning curve! I had lots of fun and have learnt vital lessons which will translate into real solutions for our business and our people so that we can better serve our guests, and our team!" Network Ten's Chief Programming Officer, David Mott said: "I'm delighted with the local production of Undercover Boss…Our CEOs have been extraordinary in giving of their time. I know this has been a life changing experience for them. What we have here is something quite special that Australians will love and embrace." Other companies taking part in the series include: Domino's Pizza Enterprises, Boost Juice and Veolia Environmental Services Australia. The American series of Undercover Boss launched to 38.6 million viewers in the US, making it the highest rating premiere of a reality show on record. Virgin Blue cancelled 16 flights on Wednesday as it upgrades its systems to mend a computer glitch. The airline's web and kiosk check-in services were suspended on Tuesday and are expected to be back on deck by Thursday. Customers can't make new bookings or change or cancel an existing booking while the reservation system is offline. Web check-in, Kiosk check-in and Check-mate are closed until 5am (AEDT) on Thursday. A spokeswoman for the airline said it had announced the 16 flight cancellations on Saturday but a few people may still not know about them. Virgin staff will be at airports to assist them, she said. Passengers are being urged to check in for domestic flights two hours before scheduled departure time and three hours for international journeys. An IT glitch last week sent the airline's computer system into meltdown. Virgin Blue staff nationwide had to process check-ins by hand and flights were cancelled. Thousands of passengers were delayed on Sunday and Monday last week and many were put up in hotels overnight. Dieter Mueller became the first award winning chef to open his own gourmet restaurant onboard the EUROPA. After a redesign, while docked in a Hamburg shipyard, the former euro-asian Oriental Restaurant, onboard the 5-star-plus* EUROPA was transformed into the "Restaurant Dieter Mueller." Dieter Mueller will work along side MS EUROPA's head chef, former Wohlfahrt-student Stefan Wilke, who will continue to run the other three restaurants onboard. Dieter Mueller will be in charge of his new restaurant, and be onboard 70-days a year. There will be no surcharge for dining in the 26-seat "Restaurant Dieter Mueller," which will serve dinner daily. Whether it's an ice cream parfait combining chocolate and tonka beans, a wild prawn in curry and lemongrass cappuccino, or a quail breast in a pastry leaf — the guest's of the EUROPA can now enjoy Mueller's favorite classic dishes, as well as his new culinary compositions. The cuisine of EUROPA's "Restaurant Dieter Mueller" offers a contemporary menu, with a combination of French, Asian and Mediterranean influences. The gourmet flavors of Dieter Mueller's hometown of Baden, on the east bank of the Rhine River in the southwest of Germany, will not be lost on the high seas, with recipes incorporating ingredients from this region in Germany as well. Menus will change for each cruise. "Uncompromising quality for the guests on the world's best cruise ship — that's what we're aiming for," said Mueller. 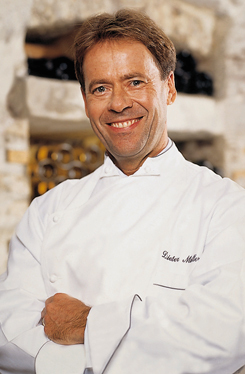 From February 1992 - February 2008, Dieter Mueller was head chef and owner of the gourmet restaurant "Dieter Mueller" in Schlosshotel Lerbach (Castle Hotel) in Bergisch, Gladbach. In February 2008 Mueller handed over the position as head chef to Nils Henkel to pursue other opportunities. Mueller is without a doubt one of the best chefs in the German speaking countries, awarded the 5-star Diamond Award by The American Academy of Hospitality Sciences. His restaurant received three Michelin stars from the Michelin Guide, and 19.5 points out of a possible 20 points from the Gault-Millau (one of the most influential French restaurant guide books in the world). No chef has ever received 20 points from the Gault-Millau, and he is the only German chef with 19.5 points. The Gault Millau called him "One of the 16 Best Head Chefs in the World" and the German gourmet magazine "Der Feinschmecker" called his restaurant: "perfect in all aspects." "Since its commissioning, the EUROPA has progressed from a traditional cruise ship to a modern day vessel competing with today's new ships in all areas including superior cuisine," said Sebastian Ahrens, Managing Director of Hapag-Lloyd Cruises. Dieter Mueller's will be onboard the international cruise (Germany/English) from Darwin/Australia to Sydney/Australia, making stops in Papua New Guinea, from January 28-February 17, 2011. Self-drive holidays in New Zealand are about to become easier – and safer – for tourists from Australia and elsewhere. New Zealand has agreed to change its most eccentric road-rule. The country’s Transport Minister Steven Joyce has confirmed that the “confusing” Kiwi give-way rule for turning vehicles will be brought into line with the rest of the world. The NZ Automobile Association estimates that the wacky give-way rule plays a part in 2560 intersection crashes, and one or twodeaths, each year. As it stands, the New Zealand rule demands that drivers give way to every vehicle approaching or crossing from the right. Even when you are making a simple left-hand turn at a crossroad, a car facing you coming from the opposite direction and turning right has right of way. About 17% of crashes in New Zealand are at intersections. International tourists driving rental cars or motorhomes are at serious risk if the rule catches them by surprise. Sometimes other vehicles catch them by surprise at the same time. Introduced in 1977 for obscure reasons, the rule has proved a boon for Kiwi panel-beaters and a major pain for the country’s rental car companies. New Zealand is the only country in the world to have the rule. Under the changes announced, left-turning traffic will no longer have to give way to right-turning traffic coming towards it. The rule is to be reversed so that the left turning vehicle has right of way – like everywhere else in the world. Right-hand-driving countries observe the same rule in a correspondingly opposite manner. Similar changes are also planned to the rule for T-intersections, a notorious source of crashes for tourists. An online poll conducted by Fairfax media in New Zealand last week indicated that nearly 63% of New Zealanders support the change. Over 15,000 people responded to the online poll. One problem remains: the changes won’t take effect until early 2012. Both the US State Department and the British Foreign Office heightened warnings Sunday for European travel, days after reports that intelligence agencies had learned of a terrorist plot to attack targets in Germany and elsewhere in Europe. "We can confirm that the travel advice for France and Germany has been updated," a foreign office spokeswoman told AFP. Earlier Sunday, the US State Department released an official alert for Americans travelling to Europe, reminding US citizens to be aware of the chance that attackers could target "public transportation and other tourist infrastructure." "Current information suggests that al-Qaida and affiliated organisations continue to plan terrorist attacks," the alert stated. "European governments have taken action to guard against a terrorist attack and some have spoken publicly about the heightened threat conditions." The State Department alert did not list any specific warnings for individual countries in Europe. UK Home Secretary Theresa May called on British nationals to report any suspicious activities to authorities. Citing intelligence officials and people familiar with the matter, National Public Radio in the United States reported Friday that al-Qaida boss Osama bin Laden sent a directive to the terrorist network's partners months ago, ordering a Mumbai-style attack on at least three European countries – Germany, Britain and France. More than 160 people were killed in the 2008 shooting and bombing attacks in India's largest city. Some officials worried that members of the commando-style teams could be travelling to the West using European passports, thus complicating any effort to find and stop them. Despite media reports, the German Interior Ministry announced Wednesday that it would not raise the threat level for the country. Der Spiegel magazine reported that the latest terror plot was uncovered during interrogations of a German-Afghan detainee being held at the Bagram US army base in Afghanistan. Twitter tips, up-to-the minute websites and customised apps bursting with locals' advice are all changing the way we travel. But does it mean the end of the guidebooks? Eight years ago this September I was furiously flicking through Lonely Planet's Europe on a Shoestring guide. I had finished school, worked all summer, and was heading off on a tour of European football grounds. The guidebook was more than 1,000 pages long and weighed almost as much as my luggage. It was the combined work of a dozen of Lonely Planet's elite travel writers, and for a month it was my bible. Four weeks ago I visited Manchester on a short break. I took a change of pants and socks, a spare T-shirt and my mobile phone. When I arrived in the city, I told Twitter that I was hungry, and within minutes I was gorging on corned-beef hash thanks to a recommendation from a fellow Tweeter. I held my phone up to Piccadilly Gardens, turned on an app, and its Wikipedia entry flashed across my screen, overlaid on to the grass in front of me through the camera in my phone. I opened another app, and dozens of local suggestions were hovering around me. There was a bar 288m from where I was standing where I'd get a free drink if I mentioned a secret word to a barman called Angus. Eight years isn't a very long time. But very little remains of how I used to travel. Things started to change the first summer after my football trip, two weeks prior to a journey through the Balkans. I spent hours scouring the internet for bus routes through Montenegro, and ferry timetables among the Dalmatian islands, and where to locate the cheapest bed in Ljubljana. And the internet always had an answer, often contributed by a local or someone who had just been there. I found a cheap hotel in Sarajevo through the then three-year-old TripAdvisor, recommended by an actual Bosnian. In Belgrade, another user-generated tips site recommended a tiny restaurant in the old town where I could stuff myself with lamb stew for £2 and wash it down with a 15p glass of plum brandy. When I got home, I was a guidebook refusenik. They offered me nothing beyond the decently concise history section. Their information was limited when compared with the internet's infinite channels of wisdom. And it was outdated from the moment it was printed. I even decided to start my own user-generated travel site, Young in Europe (RIP), to collate the tips of student backpackers as they returned from their travels. Why on earth would I want to know what a travel writer thought was great when I could find out what 200 people like me thought was great? My website was relatively successful, and the Guardian invited me to write a monthly column during my final year at university. I was to visit different cities in Europe for as little money as possible. I Googled my brains out. Gradually a new obsession replaced the old one. The user-generated content was increasingly conflicted and there was just too much of it. So I moved on to blogs. At the time they seemed perfect: bedroom writers sharing their enthusiasm for places in their city. It was idiosyncratic, specialised information straight from the locals' mouths. I went to New York to meet the writers of Gridskipper – one of the best blogs in the business (which now, for the record, is crap) – and spent a week living their life. One night I was taken to a clandestine warehouse table-tennis club in Brooklyn. It was outrageously pretentious but couldn't have been further from the tourist trail – which is what I was after. With each online development, I felt like I was getting closer to the locals. My next obsession took me into their homes. I started extensively using CouchSurfing – a wildly popular site that helps people find free beds and couches in cities all around the world. I stayed in student dorms in Swedish university towns and plush colonial-era houses in Madrid via communist-built tower blocks on the outskirts of Wroclaw in Poland. I learned more about a city in two hours with a local than I did reading the entire city section in a guidebook. Benji on a 'TwiTrip' in Croatia. And then, about 18 months ago, I started travelling with Twitter. I headed off on assignments without planning a thing. I began in Paris, where I arrived at the Gare du Nord and began slinging questions into the ether. For 48 hours the people of Twitter guided me around the city, from backstreet art galleries in obscure eastern suburbs to glorious belle époque eating halls in Montmartre. Every tip was tailored to my exact time and location. I wasn't recommended any old restaurant for dinner either – I was urged to go to one within a 10-minute walk of where I was standing. I've been on regular "TwiTrips" ever since and am never disappointed with what is recommended… from genteel picnics on Oxford college lawns to transvestite cabaret clubs in Blackpool. And now my expectations of what the web can do for travel is changing again. The last year has seen the proliferation of location-based apps, tailored to be permanently aware of where their users are. When you open Foursquare, the trailblazer of the new wave, the GPS in your phone tells the app where you are standing and displays dozens of tips within a few minutes of your precise location. It can even tell you who is in them – users are encouraged to "check in" wherever they are in order to accrue points and badges. It's geeky, but it's working – the game element is catalysing Foursquare's exponential growth. The site counted its 3 millionth user in August, less than two months after it passed the 2 million mark. On Yelp, another location-based app, nearby destinations are also rated by users, and you can choose the most popular gallery or bar or restaurant closest to where you are standing. What once required hours of rifling through guidebooks, or Googling into the provincial nooks of the internet, is now attainable in an instant. And increasingly we don't need to find the information. It can find us. Having convinced the online public to reveal who they are (through social networking sites such as Facebook) and what they are doing (via Twitter), the web's latest question is significantly more zoomed in: where are you? Location-specific information is what we want, especially when we are travelling. In a survey conducted for the World Travel and Tourism Council, 63% of travellers revealed that they used a mobile map service on holiday, significantly more than any other web service – including social networks, blogs, podcasts and the rest. The number one travel-related search term in the UK is Google Maps, and has been for a long time. The location apps seem to be feeding from our desire to be more adventurous when we leave our homes. According to Tim Hughes, an internet travel industry expert, after 15 years of online travel being about transactions, "We are moving from answering closed questions – how much for a ticket to New York? – to answering open ones – where should I go next?" It seems we are getting more open to ideas because we know just how many ideas are out there via a few clicks on your phone. And soon perhaps we won't even have to click. Siri, an app billed as "the personal assistant on your phone" and currently available in the US only, weaves together listings from dozens of services – flight finders, restaurant recommendations, taxi services, live music – and pulls them into a single place. Robert Scoble, an American tech evangelist, ran a blog post in February proclaiming that "if you miss Siri, you'll miss the future of the web". You don't type into Siri; you talk to it. The app gradually learns to understand your voice, and can process multifaceted requests, such as: "Where is a romantic Italian restaurant with a table at 8pm close to where I am?" It even helps you when you mess up your words. When asked to "Take me drunk, I'm home", Siri will order a taxi to arrive at exactly where you are standing. Until recently, however, there's been a significant snag. Using the web from your phone while abroad can mean returning home to gargantuan phone bills. But even that's beginning to change. Last July roaming prices were slashed across Europe as the EC capped wholesale data transfer at 85p per megabyte – a 70% cut on some previous tariffs. This week the EU Digital Agenda Commissioner proposed banning roaming charges altogether. Air Mauritius has been honored once again by the 17th World Travel Awards (WTA) in the category “Indian Ocean’s Leading Airline.” The airline which was nominated in the same category with Air France, South African Airways, Air Seychelles, Air Austral and Air Madagascar, received the award July 17th, 2010 at a gala ceremony in The City of Gold, Johannesburg, South Africa. The World Travel Awards is the most prestigious, comprehensive and sought after awards program in the global tourism industry. More than 183,000 travel, tourism and hospitality professionals vote for the winners and the award is one of the highest accolades a travel company can receive. Air Mauritius Equipment: The Mauritius Air fleet is composed of two Airbus A340-300Es, two Airbus A319-100s, four Airbus A340-300s, two Airbus A330-200s and two ATR72-500s.